MAGICAL BIMBO TRANSFORMATION - Cani & Bimbo Toy Christina. THE SINGULAR & TEXT-LESS VERSIONS OF THESE 3 IMAGES CAN BE FOUND ON MY DEVIANT-ART PAGE. First & Foremost, just to Clarify, This image has NOTHING TO DO WITH, The Strapford Pound! p.s. This is the Big Lipped Version - There are also a Normal Sized Lipped version of this image, you'll have to look on my other pages to find your preferred version. NEW LUSTOMIC COMIC - ALWAYS A BRIDE *SNAP* NEVER A MAN is OUT NOW!!! The Biggest Day of a Sissys Life, Nothing Compares to the Nervous Last Minute Butterflies, The Big & Beautiful Bridal Make-Over, The Bachelorette Night, Realising You've found the Person your Destined to spend the Rest of Your Life With, (WHETHER YOU WANT TO OR NOT)! Always a Bride *SNAP* Never a Man, CHECK IT OUT on LUSTOMIC NOW! I'm really hoping that anybody and everybody who reads it, will actually enjoy it. :D:D:D:D Its not often I actually write a comic that I personally find to be arousing (believe it or not), but I actually enjoyed writing & reading this comic. Trophy Boi - Out Now! This Image was Originally a commissioned and created in 2009. There were one or two elements within the image, which at the time I didn't realise were an issue, nor did I have the artistic ability to correct them if I had. There is also a slightly ALTERNATIVE VERSION to this image, where the Jedi has a slight Facial Veil which can be seen *HERE* on My DeviantArt Page. The Original Clothing Concept Idea's from 2009, for the 'May the Sith' Star Wars themed image. 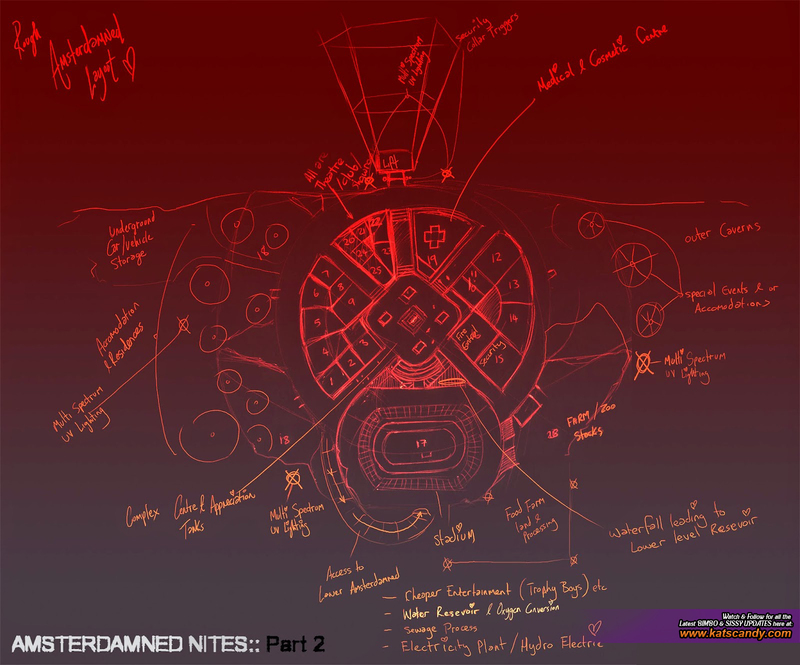 CONCEPT ART:: THE RED GLOW OF AMSTERDAMNED NITES! Initially I imagined Amsterdamned, in my mind to look almost like a Medieval Market Place or an Underground Tunnel System, with 'Fire Barrels' everywhere coating the tunnel walls with a Red Glow. Once I started planning what was needed within the 'Walls of Amsterdamned', I soon realised, I needed to make the Area much, MUCH Larger, More Isolated, Further Underground & Completely Cut Off from the Outer World and Self-Sustaining (which made the fire barrels even less of a good idea ^^ = pollution). This led to Amsterdamned becoming more like an Underground Business/ Holiday Complex rather than a Welcome-One-&-All Public Sexual Theme Park, in order for the location to remain grounded with a slight sense of realism and the possibility that such a place could even exist in a Real (fantasy) World.